Travel around the city in no time with the motorized LEGO® City High-speed Passenger Train! Operate the 8-channel, 7-speed infrared remote control to power around the curved tracks at top speed. This streamlined, super-efficient train has a high-speed front profile and electricity contact points on top. Lift off the roof of the front car to place the driver inside at the cool dashboard and open the passenger cars to access the seats and tables. Wait for the train with the traveler at the way station, and pedal safely across the crossing with the cyclist once the train has gone past. Includes 3 minifigures: train driver, traveler and a cyclist. Price is 24% above the initial Lego retail price! This comes down to 27.86 cent per brick. The High-speed Passenger Train (60051) Lego set is available from the sites below. However, they do not offer delivery to your selected region. 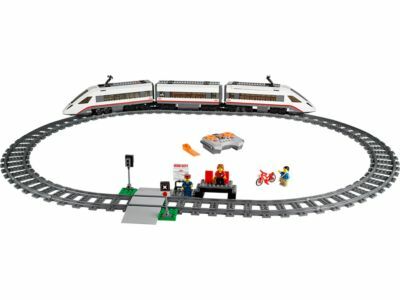 The High-speed Passenger Train (60051) Lego set is no longer directly available from the sites below. However, 3rd party partners of these sites might still have the set available. Alternate description Drive the motorized LEGO® City High-speed Passenger Train with a 7-speed infrared remote control plus circular track and way station.